Like the tale of the six blind men and the elephant, getting the big picture on global forest resources isn’t so simple. Each of the men checked out a different part of the elephant – leg, tusk, trunk, ear, tail, side – which resulted in different assessments of the creature and consequent disputes. Of course, not one had a full picture or holistic perspective; each had to rely on his own limited observations. This week we have the opportunity to compare different assessment of the world’s forests. FAO presents the results of the Global Forest Resources Assessment 2015 (FRA 2015) at the World Forestry Congress in Durban. Global Forest Watch has released new global satellite observations of tree cover reductions in 2014. And Nature has published an article describing over 400,000 field plots from national forest inventories that were used to count all of the world’s trees. So, what do these different studies have to say about the forest resources of the world and how they change? FRA 2015 is the latest in a 70-year series of reports from the UN agency. While at FAO, I coordinated the 2000 and 2005 editions of FRA, so I am well aware of the strengths and weaknesses of this process. The FRA reports broadly on forest resources, their management and use in all countries, and its most prominent result remains the change in forest area, both globally and by country. This variable is one of the Millennium Development Goals indicators, and is the one proxy for forest change that is widely published. As it depends mainly on individual country reporting, the FRA process on the one hand builds on solid engagement among national institutions in all countries, but on the other hand it must deal with data shortages and inconsistencies. Forest area change is a net change figure that hides the total numbers of deforestation and forest expansion (within countries), as well as masking any improvements or degradation within the forest. Looking at the net area change is therefore an incomplete perspective, albeit one that is easy to report for a complete set of countries. Interestingly, the FRA 2015 report shows a continued sharp decrease of net forest area losses, now standing at -3.3 Mha/yr, with an indicated gross loss (deforestation) of -7.6 Mha/yr, mainly in the tropics. 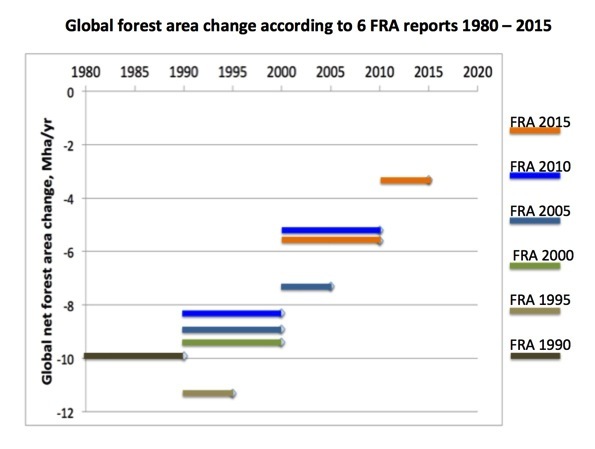 The graph below illustrates how subsequent FRA’s have reported a decreasing net forest loss over the past 35 years, indicating that we may soon have an area-wise balanced forest estate in the world. Global Forest Watch makes clear that they report only on global tree cover reductions for 2014 in their new release. Previous papers have included tree cover increases as well, but this has been criticized as the remote sensing data are not accurate enough to pick up slow increases of tree cover, so “losses” and “gains” cannot be compared. We must also note that tree cover is not the same as forest cover, and that tree cover loss is very different from forest loss. GFW tells us that the world lost 18 Mha of trees in 2014, out of which 9.9 Mha were in the tropics. As noted in an earlier blog, the non-tropical tree reductions reported by GFW appear to be well balanced by tree growth in managed forests – which are not reported by GFW. As for the tropics, the 9.9 Mha of losses appear to match the FRA 2015 indication of deforestation, especially as some of the GFW reductions are likely not attributed to deforestation events. Contrary to FRA 2015, however, the GFW update comes with quite different and alarming messages. Their press release reports that “tree cover loss is rapidly accelerating in the tropics”, and their release blog states “the increasing pace of tree cover loss in the tropics is of great concern”. It is not obvious to me that these statements are founded in the results of the GFW update. The global tree count paper in Nature takes a third approach to studying the world’s forests. Based on more than 400,000 “ground-sourced” plots in the field, the article presents the highest quality data of the three studies, with potential for more detailed analyses. For some reason, the sheer count of trees is elevated to the most prominent finding, whereas forest area or carbon stock estimates are not included – perhaps the intent was to save these for future papers? There are apparently around three trillion trees larger than 10 cm dbh. Applying growth models to determine the gain of these trees over time could become an excellent complement to the GFW data on tree cover loss. Instead, the paper goes into an analysis on (potential) threats to trees and uses GFW results to estimate the number of trees lost – about 15 billion per year – with no estimate for the number of newly established trees. This is quite an incomplete scientific conclusion given the major efforts of reforestation (27 Mha/yr according to FRA 2015) through planted and naturally regenerating trees, suggesting that the losses and gains of trees in the world are much more balanced. So we have three diverse tales and sets of numbers about how the world’s forests are changing. For my part, I want to end this blog with words of caution and counsel. First, we – and I include CIFOR – must be responsible about the messages we pass around in reports, the media and social networks. There have already been many uncritical alarmist tweets that, by force of habit, pass on dramatic statements from the new global forest reports. The story needs to be nuanced and does not have to be sensational at all times. Second, I recommend thoughtful and long-term investment by public sector entities in consolidated monitoring efforts. At national level, FRA 2015 reports on increased investments in national forest inventories, but we don’t appear to see similar initiatives on the global scene. The UN mandate could be combined with scientific research in more constructive and holistic ways. Third, note that the “elephant” is much more complex than the simple messages gleaned from complicated algorithms and space technology. Forests and forestry should be monitored from a holistic perspective, with a clear ambition to include all contributions to sustainable development – across social, economic and environmental dimensions. The FRA process is set up to do this, but this does not come through strongly in its 2015 edition. And scientific studies often zoom in on inspiring, but limiting, technology such as satellite remote sensing. Simply put, embracing the complexity of reality will take us much further than complicated answers to simplified questions. This post originally appeared on CIFOR’s Director General’s blog.